The Barbour Clyde Long Quilt from the Winter Tartan collection has been inspired by nature and the environment. 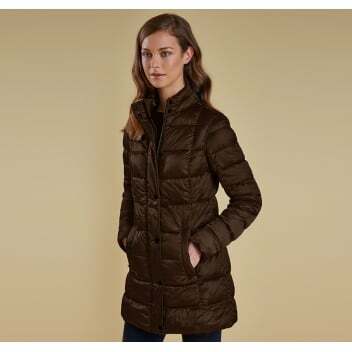 This ultra-light but beautifully warm and contemporary style coat is horizontally quilted and is finished with a super cosy funnel collar as well as exposed zips to center front and handwarmer pockets. Stylishly trimmed with Barbour’s signature winter tartan at the inner lining as well as Barbour’s embroidered branding on the pocket complete the garment to the highest of standards.